Mail used to be one of my favorite things in the world. I was always excited to see what might be in the mailbox today: a letter from one of my many correspondents, a magazine, a check, photos I’d sent out for processing, a gift from a friend or relative, a catalog full of interesting things, or a package containing one of the interesting things I’d ordered from the catalog. Some days I got nothing, and many days I got only bills or junk mail. But the tiny thrill of finding something interesting in my mailbox was always something to look forward to. Times have changed. Although the U.S. Postal Service is still doing brisk business, my love affair with mail has faded. I still have lots of correspondents, but we communicate electronically. I receive and pay most of my bills online too. Photos, of course, go straight from my phone or camera to my computer and/or the cloud. And the whole notion of “mail order” seems quaintly anachronistic, even though the mail carrier is sometimes the person who delivers the stuff I order online. Yes, I do still get the occasional check or letter in the mail, but for the most part, the spark is gone. 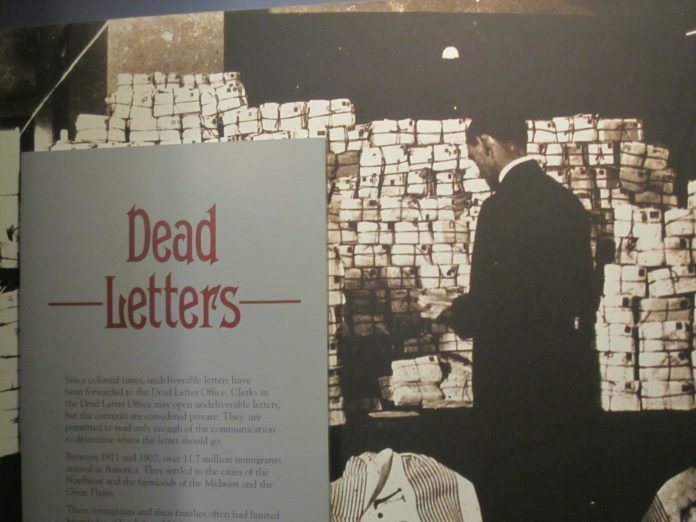 One day, though, I was in a library looking at a book from the early 1900s in which there happened to be an extensive discussion of the Dead Letter Office. All at once, childhood memories came racing back: stern warnings from teachers and parents to address mail properly, always include a return address, and, when sending a package, put an extra copy of the address inside. Were we not to do these things, the grown-ups cautioned us, our mail may end up in this mysterious and spooky room where it would, so we were led to believe, be unrecoverable for all eternity. And I remembered fantasizing about visiting that sacred vault, wherever it may be, wondering what incredible treasures I might find among its misaddressed envelopes and parcels. The century-old book provided a rather more prosaic description of how the Dead Letter Office had functioned at that time. And that got me thinking: is there still such a thing today? Where do letters really go when they die? The answer, surprisingly enough, is Atlanta. There, the U.S. Postal Service operates a large facility called a Mail Recovery Center (MRC), as the “dead letter office” has been known officially since 1992. (Formerly, there were also MRCs in St. Paul, Minnesota and San Francisco.) The Post Office established the first dead letter office in 1825; from then until 1917, all undeliverable mail was sent to a single, central location in Washington, D.C. Then, for nearly a century, the operation was decentralized, but now the Atlanta facility handles all of the nation’s nearly 90 million undeliverable items per year. Items arrive at the MRC when they can be neither delivered nor returned—meaning both the recipient’s address and the sender’s address are incorrect, illegible, or missing. There, the pieces follow one of two paths—one for letters, one for parcels. Letters are scanned by machine for currency, checks, or other items of obvious value. If such enclosures are discovered, the envelopes are opened and examined. (Incidentally, Mail Recovery Center clerks are the only people who can legally open someone else’s mail—for everyone else, it would be a federal offense.) The Post Office makes an effort to locate either the sender or the recipient, using any clues available in the letter itself; if successful, they return the valuables. The rest of the letters are unceremoniously shredded—love letters, poems, manifestos, everything. Packages are a bit different: every one must be opened and inspected by hand. Again, postal workers look for an enclosed address or some other kind of clue—a name, a phone number, or anything they can use to discover the item’s rightful owner. If they do find the owner, which happens about a quarter of the time, they normally forward the item without charge. If not, the contents of the package are stored for 30–180 days, in case someone files a claim. Unclaimed items left longer than that are recycled, given away to charities, or sold at auction. At these auctions, which are held online periodically, bargain-hunters can bid on large lots of merchandise—the quantity is simply too great to auction each item individually. Income from the auctions pays for just a portion of the MRCs’ operating expenses, which are considerable. Although a great many of the items that arrive at the MRC are truly dead, the purpose of the facility is in fact to resurrect as many as possible—it’s really an undead letter office. MRC employees have found an astonishing variety of items—not only common items like books and CDs but jewelry, computers, live animals, drugs, guns, human remains, and everything else imaginable. And, from all accounts, they find it quite rewarding to reunite lost belongings with their owners. It sounds like the perfect job for someone who still loves getting surprises in the mail. Note: This is an updated version of an article that originally appeared on Interesting Thing of the Day on April 21, 2005.